Looks a little top heavy. 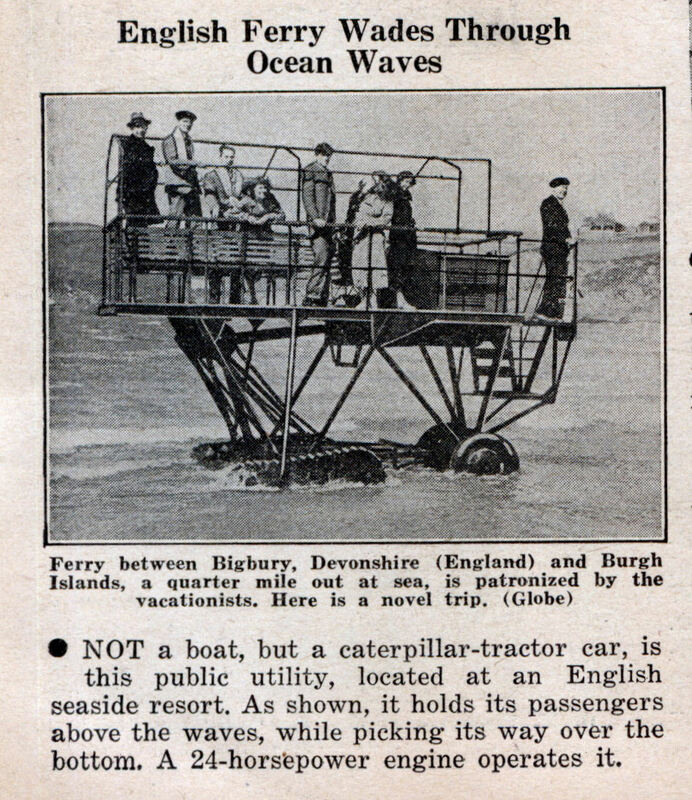 The recent version is very useful and fun, getting you to the pub and back when the tide’s in. One of the few vehicles allowed on the sand bar stretch apart from the hotel’s 4x4s. I’ve been to Burgh Island – great place – the current “tractor ferry” is a 1960s replacement I think: sadly it was away for maintenance during my visit. In a nutshell, it used to run on undersea rails between the piers of two towns in Sussex. It carried 150 passengers and kept them dry. Was it a pitrol or deesel? The early 60’s version is featured in the Dave Clark Five movie, CATCH US IF YOU CAN (aka HAVING A WILD WEEKEND) (1965), directed by John Boorman.